The kids’ lawsuit over climate change is our best hope now. Luckily, they just cleared a major bar. 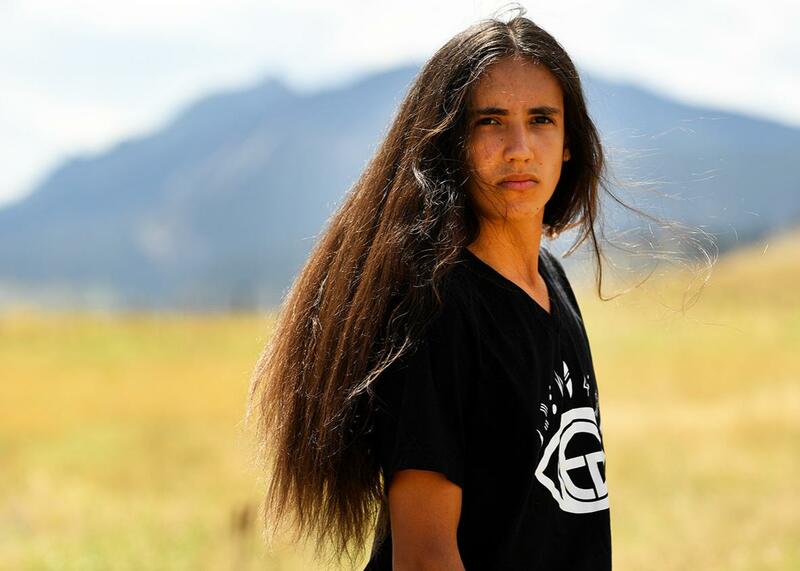 Xiuhtezcatl Martinez, pictured in the foothills of north Boulder, Colorado, on Aug. 11, is one of the young plaintiffs in the climate case. After a week that sent advocates of a habitable Earth reeling, new hope has emerged that could make way for substantial climate action in the near term—even during a Trump administration: The children and young adults suing the federal government for their right to a stable climate can now proceed to trial, an unprecedented move in the American legal system. The path was cleared by a federal district court judge in Oregon who wrote an opinion preliminarily finding that a stable climate is a fundamental constitutional right. In the groundbreaking decision, announced on Thursday, U.S. District Court Judge Ann Aiken ruled in favor of a group of 21 children and young adults in their suit against the federal government. In denying the government’s motion to dismiss, Aiken, based in Eugene, Oregon, opened a path for an eventual court-mandated, science-based plan to bring about sharp emissions reductions in the United States. The case, Juliana v. United States, will now go to trial starting sometime in 2017 and could prove to be a major civil rights suit, eventually finding its way to the U.S. Supreme Court. “This is going to be the trial of our lifetimes,” said Xiuhtezcatl Martinez, a 16-year-old plaintiff, in a statement. The young plaintiffs, who range in age from 9 to 20, allege that climate change violates their constitutional rights to life, liberty, and property by causing direct harm and destroying so-called public trust assets such as coastlines. The case argues that climate change is worsened by the aggregated actions of the federal government in permitting fossil fuel development, subsidizing the fossil fuel industry, and many other such actions. Further, the children and their lawyers say these government actions are willfully prioritizing short-term profit, convenience, and the concerns of current generations over those of future generations. The plaintiffs state that the government and these companies have continued to prioritize these short-term gains for more than five decades with full knowledge of the extreme dangers they posed. Lead plaintiff Kelsey Juliana, who lives in Oregon, alleges that algae blooms harm the water she needs to drink and that low water levels caused by drought kill the wild salmon she needs to eat. Martinez, who lives in Colorado, alleges increased wildfires and extreme flooding jeopardize his personal safety. Other plaintiffs are from farming families, suffer from asthma, and have had their homes overrun by raw sewage during the recent floods in Louisiana. The suit claims that by failing to protect these children from human-caused climate-related harm, the government violated the Due Process Clause of the Fifth Amendment. It goes on to say that these harms, and others, are caused in part by climate change and are preventable if the government acts to hasten the transition to a zero-carbon economy. I have no doubt that the right to a climate system capable of sustaining human life is fundamental to a free and ordered society. Just as marriage is the foundation of the family, a stable climate system is quite literally the foundation of society, without which there would be neither civilization nor progress. … To hold otherwise would be to say that the Constitution affords no protection against a government’s knowing decision to poison the air its citizens breathe or the water its citizens drink. Julia Olson, the lead counsel for the plaintiffs and executive director of Our Children’s Trust, the Oregon-based nonprofit that helped bring the lawsuit, called the decision “one of the most significant in our nation’s history.” According to other legal experts I consulted, she might be right. It couldn’t have come soon enough. President-elect Donald Trump does not believe climate change is real, and the information we currently have about how he would address the global crisis suggests his actions would be both woefully inadequate and possibly devastating. On Sunday, a report from Reuters cited a source within Trump’s White House transition team saying that the new administration is seeking an accelerated timeline for American withdraw from not only the Paris Agreement that committed virtually all nations on Earth to reduce their emissions but also the 1992 parent treaty, which laid the groundwork for international collaboration on global warming. Of course, the suit will not have an immediate effect on policy. The trial and appeals process could take years, even in the best-case scenario. Another climate law expert I spoke with, Michael Blumm at Lewis and Clark Law School, said he expected lawyers for the Trump administration to attempt to drag the process out as long as possible. Still, the existence of Aiken’s decision delineating a new fundamental right to a safe climate in federal court now means the odds have greatly increased that a new avenue to require climate action has been established. The suit is currently against President Barack Obama, as well as several parts of the executive branch, like the Department of Transportation. Trump will automatically become a named defendant when he assumes the presidency on Jan. 20, Olson told CNN. The case has not yet gone to trial, so the speculation on a Supreme Court ruling is premature, Blumm said. But if it goes forward, such a constitutional ruling would be “potentially much more durable than an executive order, for example, and more enforceable” than existing climate rules and legislation. Fundamental to the lawsuit is the fact that the United States is the country with the single greatest historical responsibility for causing climate change—about 25 percent of historical emissions since the start of the industrial revolution are from this country. This country also has among the greatest capacity for quickly marshaling resources to solve the problem. In recent days, as details of a future Trump administration emerge—including the nomination of a climate denier as the lead of his Environmental Protection Agency transition team—it is now likely that U.S. carbon emissions will remain flat or even grow slightly for the next four years and then for at least a decade after Trump leaves office, as a consequence of his likely policies. This development has likely eliminated the small remaining window for global climate action to keep warming this century to less than 2 degrees Celsius, as agreed upon in the 2015 Paris accord, which went into force on Nov. 4 of this year. If the Paris accord does not last, global emissions, which have been roughly flat since 2013, could go back up. Separately, a new study out this week considered how a resumption of business-as-usual increases in emissions might affect the climate. The new research found that a worst-case scenario of warming may induce an unimaginable level of impacts by the end of the century, including a temperature rise of between 4 and more than 7 degrees Celsius, more than the currently accepted 3.5 to 4.5 degrees. (Remember, the Paris accord is attempting to keep warming to 2 degrees Celsius.) A 7 degree rise would render some currently densely populated parts of the planet—parts of India, China, and the eastern United States—too hot for human habitation. Under such conditions, our bodies wouldn’t be able to sweat enough during the peak summer months to keep us alive. Factoring in the likely consequences of that reality—mass migration, conflicts over resources, and economic collapse—global society may begin to break down. It would effectively be the apocalypse. The lawsuit offers a path forward for fighting this outcome.